The designing of both coins coincided with a conspiracy to oust Chief Engraver James Barton Longacre. Mint Director Robert Maskell Patterson sought to replace him with the great medalist Charles Cushing Wright, and the corrupt Chief Coiner Franklin Peale feared that Longacre would disrupt his illicit medal-making racket. Patterson and Peale harassed Longacre mercilessly at every turn, forcing him to create three separate Double Eagle obverses before the first patterns could be struck bearing the date 1849 (Judd 117, 118). Longacre, whose initials JBL appear on Liberty’s neck, survived the campaign, and developmental patterns were struck in silver without a date in early 1850. Circulation coinage finally began on January 26. 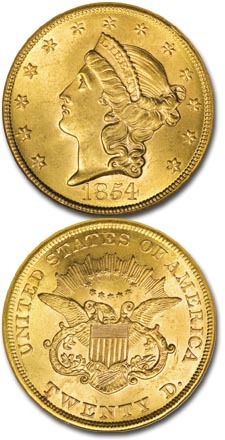 The Type 1 (or No Motto) Liberty Head double eagles were struck at the Philadelphia Mint every year from 1850 through 1865, at New Orleans from 1850 through 1861, and at San Francisco from 1854 through 1866. The O or S mintmark is found below the eagle’s tail. Average mintages were several hundred thousand, but ranged up to just under three million for the 1861 issue. The San Francisco coins of 1866 were the last of the design, and were also issued as part of the Type 2 series, with the new motto IN GOD WE TRUST. These early Liberty Head double eagles range from elusive to very rare in all Mint State grades. Branch mint pieces are particularly so, with many New Orleans issues numbered among the great rarities of the series. Low mintage New Orleans dates include 1854-O with 3,250 pieces struck; 1855-O, 8,000; 1856-O, 2,250; 1859-O, 9,100; and 1860-O, 6,600 pieces. The only overdate in the series is the rare 1853 over 2, discovered in 1959 by the late Walter Breen. Other legendary rarities are the Paquet Reverse issues of 1861 and 1861-S. These coins were the result of Mint engraver Anthony C. Paquet’s attempt to improve the reverse design. Paquet used tall, boldly elongated lettering for the legend and a very narrow raised border in place of the wide rim of the Longacre reverse. This rim was inadequate to shield the design from immediate wear and caused early die breakage as well. Only two 1861 Philadelphia Paquet Reverse double eagles are knownthe MS-67 example in the Norweb Collection selling for a record $660,000. The San Francisco Mint struck 19,250 Paquet Reverse coins that made it into circulation before Mint Director Snowden’s frantic orders to stop coinage were received. Proofs of the series are excessively rare, with perhaps two known of the 1850 and 1854. Proofs were first placed on public sale in 1858, and three or four exist with this historic date. These first proof sets included the copper-nickel cent, silver half dime, dime, quarter, half dollar and dollar as well as the gold dollar, quarter eagle, half eagle, eagle and double eagle. The sets sold for $46 and appear today to have been a fantastic bargain. In the 1850’s, however, few working class Americans, merchants or professional people could afford to tie up the equivalent of five weeks’ wages that a $20 coin represented. The few collectors then active were far more interested in large cents than in gold by date. Many rarities, including the 1848 “CAL” $2.50 pieces, were casually released to circulation by their recipients. Individual numismatists such as Boston’s bean-baker Lorin G. Parmelee saved a few Proofs, but only the fabulously wealthy railroad magnate, John Work Garrett of Baltimore assembled anything like a run of early dates, including 1860 and 1862 through 1865. A similar situation exists for mint state early $20’s. Only bankers ever saw this coin in any quantity from 1857 to 1865. Very few uncirculated coins were saved, and most existing today came from the famed Baltimore Hoard of over 3,600 U.S. gold coins found by two young boys in an empty cellar in May of 1934. All of the coins were dated between 1834 and 1856. The hoard included 317 Double Eagles92 dated 1850 and one 1856-O. Rarity levels will soon change for many of these early dates. Thousands of gold coins have been recovered from the wreck of the S.S. Central America, lost in a hurricane in 1857 with over three tons of gold on its way east from California. Discovered in 1987, salvage efforts are continuing, but already hundreds of pristine 1857-S twenties along with an assortment of other early gold coins and ingots have been brought to the surface. The numismatic community anxiously awaits the cataloging and dispersal of this incredible treasure. When grading double eagles, wear is first noticeable on the locks over Liberty’s ear and on the eagle’s head and neck. Bag marks are usually a problem with these large, soft gold coins. They generally picked up many bag, reeding and contact marks even before entering circulation. The lack of high quality, and in many cases, any specimens of some dates, stops most from collecting this series by date and mintmark. It is more commonly sought as a “type” coin.